At Ashbrook Roofing, we understand that when a construction project prohibits the use of a flame or hot bitumen, it’s essential to find an alternative to securing roof felt to your roof. Self-adhesive roofing felt doesn’t require a gas torch, so it’s a much safer and easier option to install. It also has a life expectancy of around 15 years, so it’s a popular choice with DIYers and professional roofers alike. 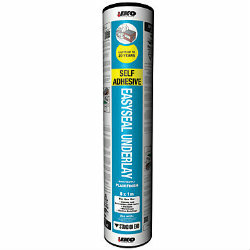 This product is suitable for use on domestic buildings with flat roofs and is useful for felting small areas such as garages, porches and dormer windows. We only stock products of the highest quality, so you can rest assured that our self-adhesive roofing felt will live up to the job of protecting your roof. We’re not just a self-adhesive roofing felt supplier; we also stock an extensive selection of roofing felt, including shed felt and torch on roof felt. Like all of the products in our range, if you order your self-adhesive roof felt before 2pm, we’ll get it to you the very next day. Place your order today with Ashbrook Roofing. We also offer free and impartial advice, including product support, to make sure you select the right products for your build.